Doing What We Can, Where We Can. Last week I had the opportunity to attend the 2011 Global Leadership Summit. …and that’s basically what happened! For two days I had the opportunity to listen and learn from a respected and eloquent roster. Of all these speakers, there was one that really stood out. She stood out because she was very different from the other leaders that spoke this year. She was soft-spoken, humble and sincere. Sincere…so much so, until you could feel it in your very being! The more she shared during her talk, the more the very essence of what she stood for touched me. This woman walked away from her career and status, to serve the children and the poor of her country. Mama Maggie Gobran is a Nobel Peace Prize nominee and the Founder and CEO of Stephen’s Children Ministry. 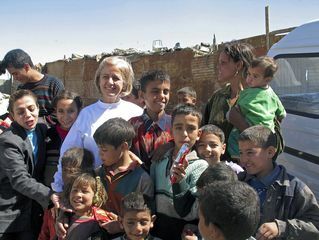 She founded this ministry to reach an impoverished and despised minority community who live and work among the garbage slums of Cairo, Egypt. Since founding Stephen’s Children she has spent over twenty years serving the poorest of the poor. After listening to Mama Maggie, it left me with the urge to simply just do what I can where I am. Life’s purpose, for many of us isn’t the same call that Mother Teresa or Mama Maggie accepted. But regardless of where our purpose may lead us, there is always a way to share a kind word and a charitable act. Plant seeds. Do what you can, where you can. Stay inspired, it’s a lifestyle choice!